A video featuring Revy's super loud wheek! The rest of us were quite startled the first few times she did this.. none of us had ever squealed so loudly before in our lives. 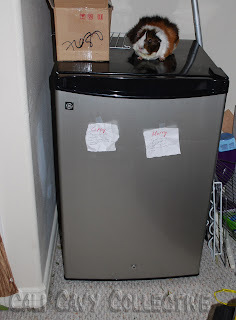 We quickly learned that her earsplitting wheek is a good thing though because if anything, it makes our slaves move even faster to give all of us food. This video was taken after her fleece bedding was changed. The humans hadn't given us all our hay yet, and one of them had just opened our fridge door (yes, whee have our own minifridge, because we are rightfully spoiled like that). Apparently Revy was hungry and decided the best way to remedy that was to demand a veggie snack at TOP VOLUME. You can even see her ears flapping up and down witheach squeal. Just call her the SuperWheeker. Wow, she's loud! I love that she causes her own ears to ruffle. My girls are now all concerned that they've heard a strange pig sounding the alarm.